If you’re a long-time Internet Explorer user, I want to start by saying I’m very sorry. You’ve probably had a rough go of it back in the days of IE6 and IE7, and have only in recent years started to feel some relief. I want you to know that you don’t have to use Internet Explorer – there are other browsers out there, and I can enthusiastically promise you that they are all faster, more secure, and better supported than Internet Explorer. Microsoft just released Internet Explorer 10, available to Windows 8 and, more recently, Windows 7 users. If you’re using either Win7 or Win8, I want to urge you to upgrade, particularly if you’re currently using anything older than Internet Explorer 9. You can find out by going to Help > About Internet Explorer on your menu. If you see anything older than 9, update right now. Yes, right now. I’ll wait. Let me just geek out for a second and say very excitedly that IE10 is set to auto-update itself by default. This may seem like a minor thing to get excited about, but you should know that the Browser Wars have been raging for over two decades, and IE auto-updating is another battle won in the great war for consistency of user experience. This means that whether you’re looking at a website in Google Chrome or Internet Explorer, it’s increasingly likely that both browsers will display the site the same way, because the more modern the IE browser you’re running, the more standards compliant it is. But none of that matters if your users don’t upgrade their browsers, which is an endemic problem for the Internet Explorer demographic. Up until IE10, updating has been entirely voluntary, which means, yes, there are still some people out there using IE6, heaven have mercy upon their poor souls for not knowing any better. Auto-updating makes my job, as a web developer, so much easier. That means I don’t have to fork code, which costs you (the client) less money, both in development time and testing. It keeps stagnation at bay; security risks don’t go unfixed for years, nay, a decade or more (IE6 was released in 2001). Of course, auto-updating is not the only reason you should upgrade. As I’ve mentioned, Internet Explorer does not have a stellar record of security, speed, or user experience. The further behind in updates you are, the more vulnerable you are to attack. If you’ve ever felt frustrated by the speed at which sites load or sites not displaying properly, it might not be you or your computer or the website; it might be your browser. My first recommendation is to use Google Chrome (particularly if you use other Google web products, like Gmail), followed by Mozilla Firefox. 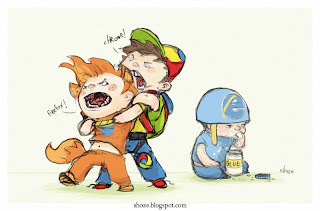 But even if you do switch to another browser for primary use, keep Internet Explorer updated. So…have you upgraded yet? If you don’t intend to, why not? Forking is creating divergent paths in code to accommodate the idiosyncrasies of the device or browser the user is viewing on.